There are several popular oils available today and the health claims or scrutiny associated with these oils can be confusing. Traditionally cooking fats come from animal sources and are solid at room temperature, while oils are extracted from a variety of plants, seeds and vegetables and are liquid at room temperature (with the exception of some tropical oils including coconut, palm and palm kernel oil, which can be solid, semisolid or liquid at room temperature). When choosing a cooking fat or oil, it’s important to consider how the oil holds up to temperature or its smoke point which is the temperature at which the oil begins to create smoke and break down. 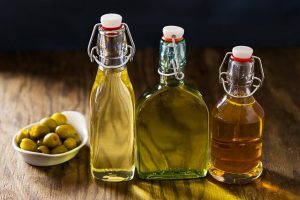 You also need to consider whether or not you want the fat or oil to add flavor to your food and the overall healthfulness of the oil’s nutrition profile. With the exception of butter, oils and fats contain no carbohydrates or protein, and the discussion of the healthfulness of oil is centered mostly on the types of fat it contains and the quality of the plants used to extract the oil. Extra Virgin Olive Oil is often on the forefront of one’s mind when referring to the Mediterranean diet. This super food oil is a healthy staple in many kitchens and is linked to heart health but it may not be ideal for every situation. Regular not extra virgin olive oil is lighter in color and has a more neutral flavor, the only pro over extra virgin olive oil is a slightly higher smoke point 465°F compared to 325-375°F of extra virgin olive oil. Pros: Contains high levels of beneficial fatty acids, as well as antioxidants that play a role in fighting off free radicals, inflammation and weight management. Cons: Can be expensive, especially for virgin and extra virgin varieties. Has a low smoke point, making it a bad choice for frying or high-heat cooking. When the oil heats up to it’s smoke point the fat changes composition and can be harmful to one’s health. Coconut Oil is flavorful tropical oil that is considered healthy by some, but has spurred a great deal of controversy due to its saturated fat content. 86 percent of its fat is the saturated type. It’s a favorite among health-conscious eaters for its high concentration of medium chain triglycerides (MCTs). The body burns MCTs immediately for fuel, decreasing the likelihood that they will be stored as fat. There is also some evidence that MCTs boost metabolism and promote satiety (a feeling of fullness). Pros: Higher smoke point 350°F, which is actually lower then some of the unhealthy oils. Rich in antioxidants and beneficial medium-chain fatty acids (these medium-chain fats are a source of controversy because they are actually saturated fats). Some research shows that are can improve brain health especially in the elderly population prone to Alzheimer’s disease. Cons: Can overpower the intended flavor of certain dishes. Good for: Moderate-temperature cooking, frying, baking, popping popcorn. Canola oil is made from a naturally modified breed of rapeseed; canola oil is commonly used for cooking. Today, canola oil is the third largest source of vegetable oil in the world after soybean oil and palm oil. Thanks to its high smoke point (475 degrees Fahrenheit), it’s commonly used in frying and baking and is also an ingredient in salad dressings, margarine and a variety of other products. Canola is also promoted as a healthy oil because of its high monounsaturated to saturated fat ratio and its concentration of omega-3s (about 11 percent of the oil’s fat is of this type). However, more than 93 percent of the canola produced in the U.S. is from genetically modified seed, so if you wish to avoid GMOs, be sure to choose products with the “organic” label. Pros: Low in saturated fat. Contains beneficial monounsaturated fats and omega-3s. Subtle taste won’t interfere with the flavor of your dish. Cons: Contains omega-6 essential fatty acids, which are overabundant in the Western diet, they are linked to inflammation. Inflammation is the leading cause of chronic disease. Margarine- A highly processed butter substitute that has been linked to increasing our risk for heart disease despite the marketing that claims it is healthier. See the ingredients in margarine and the health concerns associated. The smoke point of margarine is 360°F. Pros: There are no pros to consuming margarine, use real butter instead. Real Butter: Butter’s fat profile has had it on most people’s “unhealthy” foods list until recently, when a number of research studies evaluating the role of dietary fat in cardiovascular health have challenged the notion that saturated fat is as dangerous as previously believed. One of these, a randomized trial published in September 2014 in the Annals of Internal Medicine, found that participants eating a relatively high-fat diet (including saturated fat) had greater reductions in cardiovascular disease risk factors than those eating a low-fat diet. That’s not necessarily license to add butter to everything, however. Researchers of the study agree that the overall quality of one’s diet has the biggest impact on our health and that more research needs to be done. Use butter for flavor in cooking and watch it carefully while heating to prevent it from smoking (the milk solids in butter give it a relatively low smoke point of 350°F). Pros: Inexpensive, does not over power the flavor of dish. Cons: High in saturated fats, can cause weight gain if consumed abundantly. Good for: Baking, moderate temperature cooking, and as a spread or topping. Pros: Inexpensive, long shelf life. Contains essential fatty acids. Cons: Typically heavily processed and made from GMO sources. Some vegetable oils may be partially hydrogenated also referred to as trans fatty acids. Trans fats are highly processed and increase risk for heart disease and weight gain. Good for: Greasing pans (in a spray that delivers a very small amount) this is not the best option; I would use a high smoke point option that does not contain hydrogenated oils. NOTE *It is important to realize that many plant based oils are not stable enough to resist chemical changes when heated at a high temperature. The polyunsaturated oils including vegetable, corn, canola, and soybean create oxidized cholesterol that can inflict damage to overall health and disease risk. Corn Oil has a high smoke point of 450°F and is extremely dense in calories and fat grams. Due to the amount of GMO corn available in the form of syrups, sugar and solids it would be best to avoid consuming this type of oil in excess. Soybean Oil has a high smoke point of 450°F. This is not a preferred oil because soy in any form mimic’s estrogen increasing risk for hormone imbalance related cancers and health issues. It is also high GMO; soybean oil is highly processed and cheap, read the ingredient list and avoid products that contain it. Palm Oil has a high smoke point of 450°F, it is not as widely accepted as it’s sitser oil coconut oil because the taste is not as flavorful. Palm oil is different from other plant and animal oils in its fatty acid composition (50% saturated, 40% unsaturated, and 10% polyunsaturated) in that it does NOT promote atherosclerosis or arterial thrombosis. There are several health benefits associated with palm oil including reduced risk for heart disease, Alzheimer’s disease, cancer and cataracts to name a few. Oils are all fats and they contain 9 calories per gram compared to the 4 calories per gram that protein and carbohydrates contain. Regardless of health benefits the healthy oils should still be consumed in moderation to avoid unhealthy weight gain. Natural oils that are not manufactured and processed are the best choices to avoid excessive GMO and harmful fatty acid consumption. Avoid high temperature cooking with oils that have low smoke points.